The other reason I didn’t quite follow him was due to my ignorance about feeding deer – and hunting over it. Where I learned to hunt, baiting deer didn’t happen. In fact, it was strictly forbidden. 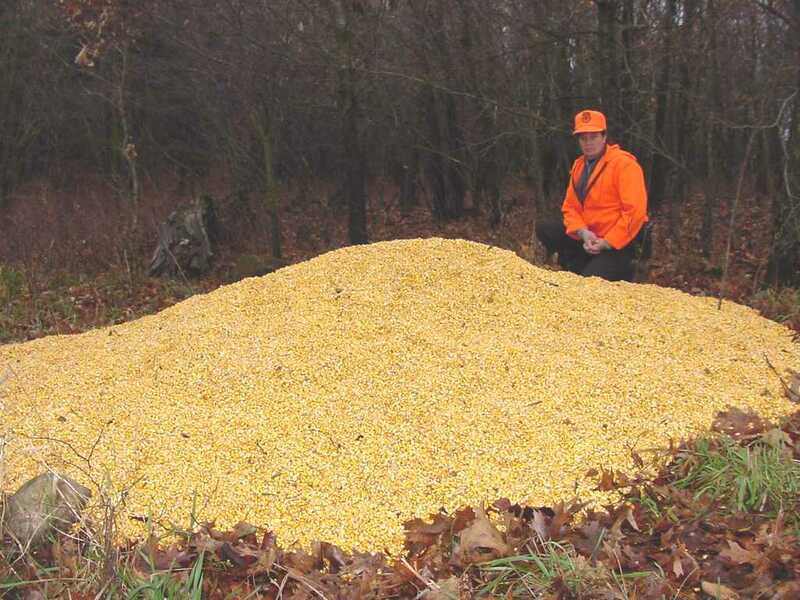 This, is a heckuva corn pile! I read an interesting article this week from outdoors writer Oak Duke (who happens to reside in the same town your faithful blogger is from). Duke considers the seemingly hypocratic actions of many states that do not allow baiting, but will allow food plots. It’s not that Duke is advocating baiting, but he points out that the reason cited by most states for not allowing baiting seems to present a clear reason why those same states should be against food plots. Basically, the reason you can’t bait is attributed to keeping them from concentrating in one area for extended periods of time. Um, isn’t that the primary reason for food plots? I’ve yet to see clear evidence that a food plot, or feeding deer, can lead to CWD in free-ranging deer. There seems to be nothing that is conclusive, in my opinion. I’m not against baiting. Does it provide a bit of an edge in the hunter’s chase? Yes, it does. But many states rely on the success of hunters to properly manage the deer herd. I don’t see how that can hurt. I do, though, think that states are being a bit hypocritical in their actions around the subject. Make a decision – then live by it. For the record, there are currently 28 states that prohibit baiting, 14 that allow it and 8 which have some conditions that allow baiting under certain conditions. 20 Years Is Too Long to Wait! I never had anything against hunters or hunting, I just didn’t grow up in the environment, although living in Western New York since the age of 11 certainly presented plenty of opportunity. I remember well how empty my high school was on opening days of deer season in the fall and secretly wishing I could be part of that. It’s taken me 20 years since that day, but I proudly say I am now part of the hunting community. I’ll save readers the political rhetoric but the bottom line for me was this: I was growing tired and weary of people around me appearing to be so helpless. While there’s nothing wrong with relying on others for help, too many people these days don’t do things for themselves when they’re perfectly capable. So a few years back, I took up gardening to provide some of my own food. And it didn’t take long for me to want to provide my own meat. 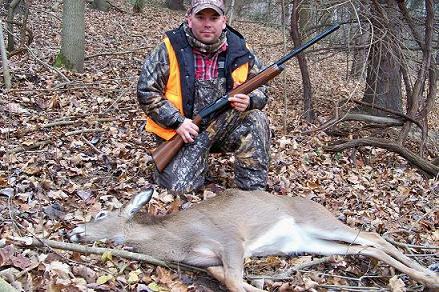 Bob Chavez waited 20 years to try hunting, and needed an extra 17 hunts before he connected on his first deer in 2009. Props are due at this point to my wife, Amy. When we met and were dating, I was not a hunter. But when I told her of my interest, she was fully supportive and remains so to this day. She even applied loving pressure when she’d remind me that the freezer downstairs remained empty. The freezer we bought specifically for venison! The 2009 season was coming at me with great anticipation. Blessed with gracious friends like Curt, Andy, Pat and Bubba, they taught me so much. How to scout for sign, where to put my stand, what to do before and after the shot. Curt even sold me my first shotgun, a Remington 1100 20-gauge. Armed with arms and knowledge, I was amped! Long story short, the bow season came and went. I had a few chances but wasn’t able to connect. My best opportunity came while hunting some land outside of the parcel I’d leased from a local farmer. As darkness drew close, Curt flushed a herd my direction and I had a doe in my bow site. 10 yards away. Perfect. Until I stood up. I brushed my bow against a branch I didn’t see and that’s all it took to send that doe running. Gun season arrived and I was growing anxious but I consoled myself by knowing the gun season was more forgiving. It didn’t help that bow season was abnormally warm and I was able to witness plenty of other wildlife. Fox. Coyote. Turkey. Fantastic stuff, and it reminded me plenty of why I loved the outdoors so much to begin with. By now, I’d tried everything. Morning hunts. Mid-day hunts. Evening hunts. I’d seen plenty and had been out 17 times but still was empty-handed. The rut was over, too. Then, the morning of Dec. 7 dawned. It dawned before I was ready and I overslept. Guh. Frustrated, I decided to head out anyway. I didn’t get to my stand until 8 a.m. but by 8:30, I was singing a different tune. Barely in my stand for 15 minutes, I saw it. Forty yards to the left, sauntering through some thick cover and heading to a lane in directly in front. I froze, then waited. When I thought it disappeared for good, I grunted anyway and a few seconds later, I saw it again. Walking right toward me, up the path I’d taken to get to my stand. A large tree stood in front of me, big enough to shield me. And when the deer kept walking and went behind the tree, that’s when I clicked my safety and rested the Remington on the shooting rail. Closer. Closer. My heart is pounding and my nose itches, but I don’t dare scratch it. Closer. Closer. I can’t miss from here. No excuse. It’s no farther than 15 yards away now! I pull the trigger, shooting nearly straight down. I didn’t have a broadside so I went for the chest. Immediately after the shot, I see the deer limping off to my left, its right front leg sticking out. Stunned, obviously. But the deer’s movement gave me a broadside and I plugged it with a perfect shot right in the vitals and I stood there in near disbelief as I watched it from my stand, pile up no more than 20 yards away. Silence. But I wanted to scream. My first deer! I stood and stared to make sure it was all real and once I gathered my senses, the first person I called was my wife. No answer, but she got an amusing voicemail where I sounded like a child who scored his first candy bar. I called Andy, then Bubba, then Curt. Andy lived nearby and came over to help me dress what turned out to be a button buck, and it really wasn’t as bad as I thought it was going to be. But I dressed it and took it to a processor. I’ve eaten venison before, but never had I eaten meat harvested by my own hands. It’s a special feeling, looking back at all the work and preparation it took to finally live that moment. Patience and persistence paid off for me and I am absolutely loving life today, knowing that I am part of the hunting community. It took me 20 years of my adult life to join and sometimes I kick myself for waiting so long because I’ve got a lot of knowledge to catch up on. But like the 17 trips into the woods before getting my first deer, it was worth the wait and I am ready for the 2010 season to begin. I just wish it were tomorrow! Bob Chavez, 40, is a veteran journalist living near Rochester, N.Y., who has loved the outdoors as a camper and hiker since his youth. He became a hunter, “officially,” in 2010 by harvesting his first deer, much to the delight of his wife and 9-year-old stepson. Until next season, he’s hunting for the best venison recipies available.